All profits will go to the legal fund to defend those arrested for peacefully defending healthy street trees in Sheffield from unnecessary felling. Normal price £108. Only £100. Ora Gallery currently have 12 prints available. All profits will go to STAG legal fund. As featured in 'Sketching for Animation' by Peter Parr. Published by Bloomsbury. Hunters Bar is an area that holds a special place in the heart of many who have lived in Sheffield. Famously, The Arctic Monkeys mentioned Hunters Bar in their song, ‘Fake Tales of San Francisco’. It is an area with its own unique personality, inspiring affection in visitors and residents alike. With landmarks, from the eponymous tollgate on Hunters Bar roundabout and the Victorian school to the Porter Brook weaving between the houses, from the small independent shops along Sharrowvale Road to the steep rows of terrace houses leading down from the hill. It has a village-like character and atmosphere with an eclectic mix of people who live and work there contributing to the vibrancy of the area. The much loved buildings and landscape of Hunters Bar are the inspiration for a fantastical work by Andy Council - The Hunters Barasaur. 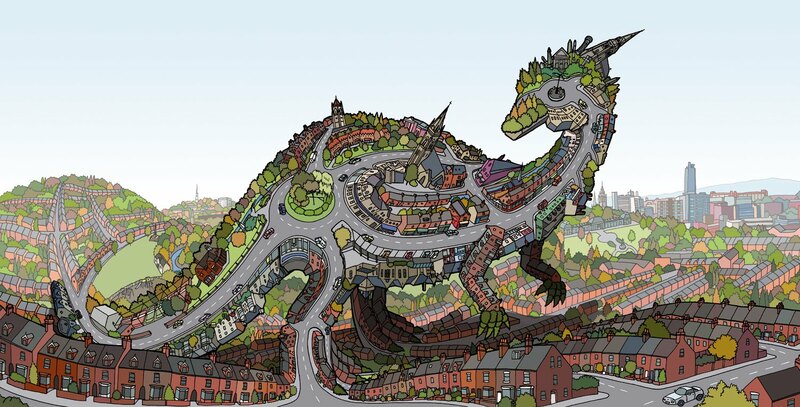 Andy has captured the geography and buildings that make the area distinct, in the form of a colossal dinosaur literally rising up from the earth beneath Hunters Bar. After thoroughly researching, photographing and sketching the area, Andy created the painstakingly detailed piece titled ‘The Hunters Barasaur’. The Hunters Barasaur follows in the footsteps of previous city dinosaur works by Andy, including: The LA Dinosaur, Bathuanadon, The Bristol Dinosaur and The Dinosaur of Crouch End. Andy Council is a celebrated street artist and illustrator from Bristol’s dynamic arts scene. In 2010 Andy exhibited with the Corey Helford Gallery in Los Angeles who brought the ‘Art From the New World’ exhibition to Bristol Museum. He has also shown his work at the RWA and has a piece in Bristol City Museum’s permanent collection. His work includes a huge mural collaboration with fellow Bristol artist Acerone in the brand new M Shed Museum in Bristol. His style is a highly individual amalgamation of architecture, structure and character; rendering intricately detailed compositions of imagined creatures composed of iconic objects and places.